I am a great lover of literature. I am also a great lover of these books, these tales. They are a modern “1001 Nights”, born of a war-torn society with Blitzkrieg ringing in their ears, and Coventry freshly wounded. “The Chronicles of Narnia” reflect British pride yet give away a certain sense of doubt and skepticism. These stories encourage a fight against evil, despite the odds of winning. It is the fight that is worth it. The first cinematic installment of these fantastic tales remained greatly faithful to CS Lewis‘s original book (with only one fabricated scene – on the icy river escaping from the wolves). It answered to some of the current trends in blockbuster film-making but it still managed to retain some soul. Prince Caspian also remains fairly faithful to the book. Some elements are glossed over or “sped through” to get to the lavish battle scenes. I would have enjoyed seeing a young Caspian with his tutor on the parapets at night as so vividly described in the book. Instead, it was only alluded to in the film. Crossing the Fords of Beruna was also severely truncated and the fact that the non-talking bear that was slain they actually butchered and carried with them for the couple of days they trekked through the woods. However, plenty of attention was given to the two main battles – at Miraz’s castle and at the ruins of the Stone Table. Both were well rendered, if a little too long. It’s as if the producers decided that the story is only there to lead up to the battle, and the battles are what sell the movies. I have 60 years of history that say otherwise, but I am not a profit-driven entity in the art business. The greatest atrocity was saved for the last three minutes. In a flagrant disregard altogether, some genius decided that it would be a great idea to have Susan (just as she is able to jump back into England forever, never to return to Narnia ever) turn back and kiss Caspian. And as if that wasn’t painful enough, their lips touching cued a trashy, t-weeny, Hannah Montana song with even worse lyrics. It was so bad that everyone in the theatre either laughed or threw up their arms in disgust. Disney/Walden Media/Adamson need to realize that these stories are already popular. We are going to the movies to see the books we read come to life, not some numbers-crunching producer who never read them (let alone under the covers with a flashlight because you couldn’t sleep without knowing what happened next) version of what will sell adjunct merchandise. They had better be careful. 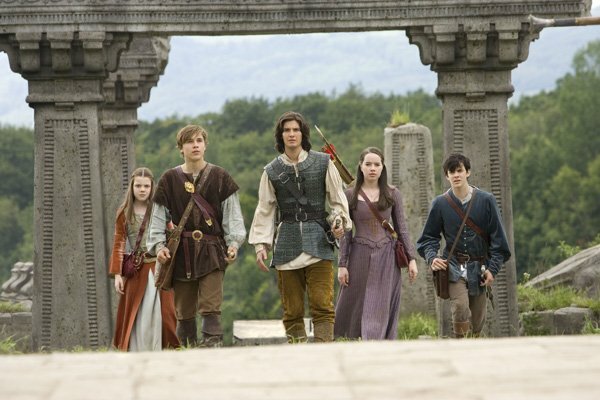 If they wish to make the entire series of 7, they better not break the trust of those who love Narnian lore.